Hello! Hard to believe my last post was in November. Secret Recipe Club ended and that was my inspiration to blog, so it seemed fitting time to pause and decide did I want to continue? I love my collection of recipes here and hope you do, too. I refer back to them often and share with family and friends. My online cooking legacy of sorts. What am I up to these days instead? In June a friend invited me to a FaceBOOK party for Usborne Books and More. I hadn't heard of these books or attended a FaceBOOK party, so of course I said yes! With two grandchildren, Chester who's 6 months and Paxton who is 6 years, Grandma needs to build their library. Reading is so important and I know i don't want the iPad to replace books. I fell in love with these books and decided to have my own party. At that time, they had a super joining special and Usborne doesn't require their consultants to meet monthly minimums, so I decided to become a consultant. I will be sharing Usborne specials, articles about reading and opportunities to win free books here. I hope you will follow along and learn more about these great books. Usborne is about MORE than just purchasing books. They offer an amazing fundraising opportunity, called CARDS FOR A CAUSE(CFAC). CFAC is boxes of 30 beautiful cards for $30.00 and the organizaiton gets $13.00 of each box sold. Great for schools, churches, cheer leading, football, etc. etc. It's the second Monday of the month and that brings us Secret Recipe Club. I'm not a fan of Monday's! Normally, Secret Recipe Club Monday's are the exception. This Monday, however, I'm sad! It's Group B's final posting. I've been a member of Secret Recipe Club almost since the beginning, most of the time as a member of Group B. A big thanks goes to all of the leaders and hostesses of this fun group, without them, we wouldn't have been posting as long as we have. Not sure exactly how long I had been a member of SRC, I searched my blog and found my first post was in June of 2011. In reading my first post, I was reminded of the "friends" I've made over the years, how much fun it has been. Reading my first post was bittersweet, my first reveal featured Daniel of the Haggis and the Herring. Daniel was one of the SRC members who passed away, far too soon, in September of 2012. Thanks to all the bloggers who have had my blog over the years and to everyone's blog I had the pleasure of featuring, it's been a great ride!! Sniff, Sniff!! Now it's time to find the happiness in this final post. When I read who I had been assigned for my final reveal, I was THRILLED to see it was Terri of Our Good Life. I've been following Terri since before she became a member of SRC. Actually I think I found her by following her daughter Ashley. When I first started following Terri, I felt an instant sisterhood. Terri lived at the time in Jefferson City, Missouri and is a big University of Missouri fan. (My son graduated from there and despite how hard it is to be a fan, right now, we're football fans too!). Terri and her husband, retired and moved to St. Charles, Missouri in 2013. If you read her blog, you'll get a glimpse into their beautiful home and life in St. Charles. She also shares with her readers, her travels, great recipes and family events. If you haven't visited Terri's blog, you're missing out, stop by soon to say hello!! I was looking for something different, perhaps something I'd never made before for the final SRC reveal. I found the perfect choice, Terri's Coffee Gelee. Unlike Terri, I love coffee, so I couldn't wait to give this interesting dessert a try. I used a chocolate/coconut flavored coffee and tossed in a teaspoon of espresso powder for a little extra zip. I also added about a teaspoon of vanilla because vanilla makes everything taste better! What a fun a versatile dessert this is, perfect light dessert at the end of a heavy meal or how about to serve at a luncheon or shower? The flavor possibilities are endless, not to mention different flavored whipping cream! 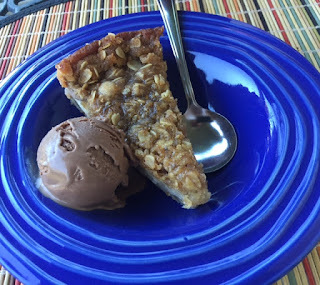 Thanks Terri for a great recipe and blogger friendship! In a sauce pan, stir the water and sugar together and bring to a boil. Boil for 1 minute and set aside. In a small bowl, soften gelatin by adding 4 T cold water and stirring. Set aside. Add the coffee to the sugar water. Stir until incorporated. Add the softened gelatin and stir until gelatin has melted. Pour into serving dishes, about 1/2 c of liquid per container. Let sit 8 hours or until gelatin has firmed up. Top with whipped cream, sprinkled with instant coffee granules. Happy Halloween!!! Can you believe it's Halloween? Not sure where this year went. Five Monday's in October brings us a bonus Secret Recipe Club reveal. I am a bit sad as I write this, Secret Recipe Club is going away. This will be my second to the last post. November will be our last posts. I've been a member since the beginning and it's been such a fun group. Sad to see it end. Do you have a fun group you're a member of? I'm looking for a new one of two to join. For this month, I was assigned Pale Yellow. Tracy, the blogger behind Pale Yellow describes herself as, "Informal science educator/curriculum specialist by day, baking blogger by night, former Michigander, current Rockaway Girl". I really like why Tracy says she blogs, "In defining what this is blog is, it was effortless to describe what the blog is not: I am not a recipe developer, I am not a baker for hire (although if you ask me nicely, I do take orders), I am not here to quit my day job, and I am not here for shameless self promotion." Very similar reasons to why I blog, although I would like to quit my day job. With the theme of this reveal being fall, around here nothing says fall like apples. Tim went with our friend, Lynn the landscaper, to pick apples. I'm guessing he came home with 20 pounds? I was drawn to Tracy's recipe for Caramel Apple Crumb Muffins, a perfect combination of fall flavors. My muffins didn't exactly turn out like muffins, they were more like a gooey cake. Absolutely delicious! Trying to figure out where I messed up and I'm just not sure. I knew the batter going into the pan was way too liquid. Rather than adjust it, I decided to go with it and I'm glad I did. Preheat the oven to 350 ˚F and liberally spray your muffin tins with Baker’s Joy. Crumb topping - Melt the butter and let cool slightly. Set aside. In a small bowl whisk together the brown sugar, 5 tablespoons flour, oats, 1 teaspoon of cinnamon, and a pinch of salt. Mix in 3 tablespoons of melted butter until the mixture is moist. Set aside. Muffins - Whisk together 1 cup flour, sugar, 1/4 teaspoon salt, 1 teaspoon cinnamon, and baking powder. Toss in the apples. In a liquid measuring cup mix together the almond milk, vanilla, 3 tablespoons melted butter, and the egg yolk. Stir into the dry ingredients until just combined. Stir in the caramel bits. Spoon into the muffin tins until about half full. Fill the rest of the tin with the crumb mixture. Really press the crumbs into the top. Bake for 18-20 minutes until the tops are brown and the middle is set. Let cool completely on a wire rack before removing from the muffin tin. It's Secret Recipe Club reveal day! Not familiar with this fun party? You can find out more here! For the month of October, I was privileged to be assigned, Lemon and Cheese, hosted by a blogger from across the pond, as they say! Nicola is a Librarian in London and loves to cook. She says " I love any sort of food and trying out new things, but tend to stick to simple cookery, with lovely fresh ingredients as well as a few helpful freezer items! Lemon and Cheese are my two favorite foods so expect a lot of them!". What a creative and fun name for a blog!!! Nicola has an extensive recipe collection on her blog. I spent several evenings browsing her blog. I was thinking I wanted to make something that had an unusual ingredient or was a recipe I wouldn't normally make. A few Sunday afternoon's ago, our first real fall day, I was in the mood to bake. I sat down to browse the baking section of Nicola's blog. When searching for a recipe, I try to locate one where I have the ingredients on hand. One particular recipe caught my eye, Banana Bread Crumble. At our house, both banana bread and crumbles are popular, so why not try a recipe that combines the best of both. We loved this crumble, reminded me of a bread pudding with a crumble on top. This recipe is a keeper!!! Served alongside a scoop of chocolate ice cream, delicious!! Preheat the oven to 180C. In a large bowl, whisk together the flour, sugar, and milk until just blended. Whisk in the melted butter. Pour the batter into a lightly greased 28cm x 18cm baking dish. Top with the banana slices. To make the topping, in a medium bowl use a fork to stir together the brown sugar, flour, and butter until it forms a crumbly mixture. Stir in the oats. Sprinkle the topping mixture over the banana slices. Bake for 40-45 mins or until golden brown. Zoodles are all the rage these days. Last year for Christmas, Tim gave me a spiralizer. We tried one of the "cheapies" we picked up somewhere for a few dollars, with not great results. This spiralizer works beautifully, producing three different size spirals. With zucchini is everywhere at the farmers market and an abundance of our garden cherry tomatoes, a perfect time for spiralized salad. I used the thick spiral for this recipe. The spiralizer also makes perfect "noodles" for pasta. At our house, we prefer the real ones! What do you make with your spiralizer? 1. For the dressing, in a small bowl, whisk together the olive oil, vinegar, garlic, salt, and pepper. Set aside. 2. Use a spiralizer to make the zucchini noodles, according to manufacturer's instructions. Alternately, you can use a mandoline or vegetable peeler. 3. In a large bowl, combine zucchini noodles, tomatoes, feta cheese, and basil. Toss to combine. When ready to serve, drizzle dressing over salad and season with salt and pepper, to taste. Note: This salad is best dressed and served immediately. As the summer growing season is the midwest comes to a close, I'm sharing one of my favorite salads from this summer. 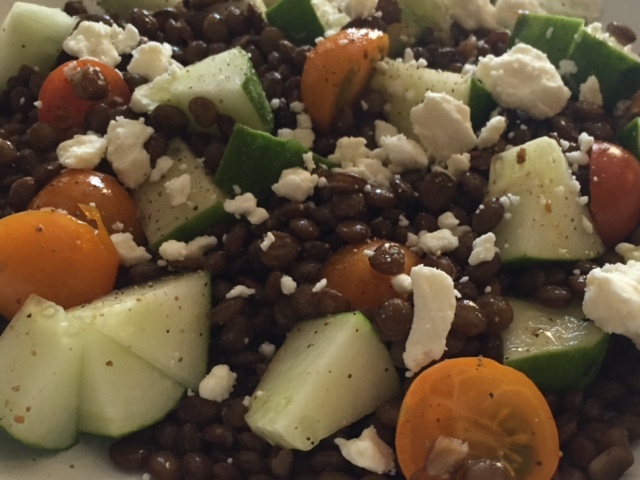 Fresh tomatoes, fresh cucumbers, salty feta and lentils make for a healthy, delicious side or lunch salad. I sent this picture to my son who said it looked just like the salads they enjoyed in Greece last year. 1. Place lentils, onion, bay leaves, and 6 cups water in large saucepan; bring to a boil. Reduce heat to medium-low, and cook 25 to 30 minutes, or until lentils are tender. Drain, remove onion and bay leaves, and cool. 2. Stir together shallot and lemon juice in large bowl. Add lentils, cucumber, tomatoes, mint, and oil; stir to combine. Season with salt and pepper, if desired. Chill 1 hour, or overnight. Serve topped with feta. September? Already? Each month at Secret Recipe Club time I am reminded how quickly time is passing and to stop and enjoy each moment! We've had a beautiful fall like weekend here! Hope you're enjoying this time of year in your part of the world. For this month's reveal, I was assigned Making Miracles. Rebekah, the blogger behind Making Miracles says " this blog began in 2006 as a way to record my experiences in surrogacy and has evolved over the years to include my day to day life, including what my kids and puppies have been up to and the latest recipes I've enjoyed creating in the kitchen." Stop by her blog, she has some amazing stories and recipes! For SRC reveals, the first recipe category I usually browse, is what else but desserts? Not only because I love desserts but also because I send something to work with Tim for their treat day each month. Rebekah has a fabulous selection of desserts to choose from. As I was reading the list of Cakes and Cupcakes, my eyes were quickly drawn to the recipe entitled Too Much Chocolate Cake. I found myself thinking, no way! In my book there's no such thing as too much chocolate anything. As I read the recipe, I was reminded of a cake I used to make years ago that was a very similar if not identical recipe. Remembering just how moist and delicious this cake was, I decided this was the recipe for this months reveal. Rebekka made her cake in a bundt pan, I used a 9 x 13. While still, warm, I topped the cake with a quick chocolate glaze. The glaze just intensifies the moistness of this cake. Delicious chocolate goodness ... never too much for me! Bake for 50 to 55 minutes (20 minutes for cupcakes), or until top is springy to the touch and a wooden toothpick inserted comes out clean. Cool cake thoroughly in pan at least an hour and a half before inverting onto a plate If desired, dust the cake with powdered sugar or top with frosting.